A family tree chart is a visual representation which shows family relations in a characteristic tree structure. Comprehensive family trees utilized in the field of medicine are called Genograms. 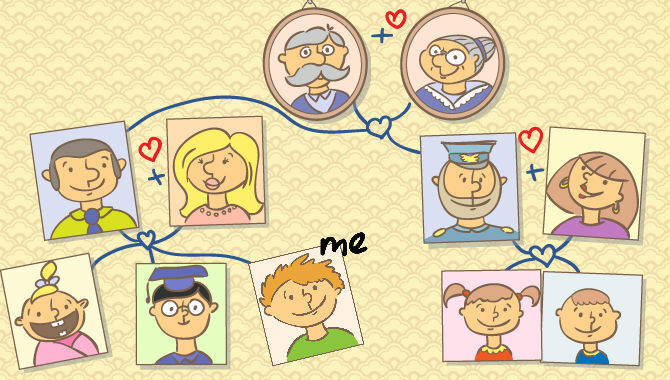 Genealogical information can be depicted in the form of the family tree. A unique family tree chart can hold up to six pedigrees. People can trace their ancestral lineage by tracing along the branches. The ancestors are positioned on the leaves on the upper side of the tree while the later generations at placed at the base. The father’s and mother’s names are written on the big branches and the children’s names are labeled on the stem. The chart closely resembles a tree, broader at the top and narrower at the bottom, hence the name family tree chart. Seek help of your parents and relations to collect information about your family and ancestors. Find details like names, specially the family names of female relatives, birth dates, marriage and death dates etc. Interview your eldest relatives to discover your family’s genesis. You may use a tape recorder or video camera to record conversations. Check if your folks emigrated from one country or state to another. Use online tools to create a family tree chart complete with names and dates. The online tools are a great way to start this. Collect documents like birth certificates, marriage records, and death documents. These records can help you check the correctness of the information collected from the family. Check the records available from the cities where your grandparents or parents lived by contacting the official bureaus, libraries and courthouses. You might find ancient wills and property documents. You can contact the national archives to recover immigration records and get assistance for researching on your family tree. Several organizations can help you discover more about your pedigree and ethnic heritage through DNA testing. You can find details about such companies on the internet. Meet your family members to share the information that you have collected. You might invite them to participate in your search. Finding your place in your family tree diagram bestows an opportunity to come closer to your roots and take pride in your lineage. The information gathered and listed in the diagram can help you keep in touch with your close and distant relatives and stay connected.